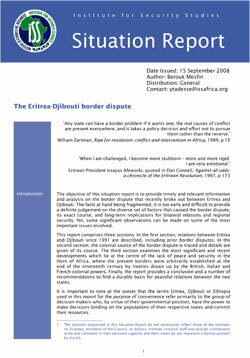 The objective of this situation report is to provide timely and relevant information and analysis on the border dispute that recently broke out between Eritrea and Djibouti. The facts at hand being fragmented, it is too early and difficult to provide a definite judgement on the diverse set of factors that caused the border dispute, its exact course, and long-term implications for bilateral relations and regional security. Yet, some significant observations can be made on some of the most important issues involved.